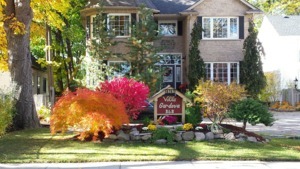 We would like to welcome you to Niagara's newly built (2002), deluxe bed & breakfast located in Niagara Falls, ON Canada. Your hosts: Gayle & Doug Hastey We are conveniently located just 1 block from the picturesque Niagara River and only a 20-minute walk to the world famous Falls and Casino Niagara. We are also only a 20 minute drive to Niagara on the Lake and Niagara's world-renowned wineries. Villa Gardenia Bed & Breakfast is a smoke-free home. We offer four spacious, beautifully decorated, comfortable guest rooms. All guest rooms have one queen size bed, a full, private ensuite bath, sitting area, fireplace, colour cable tv, DVD player with movies, radio and hi-speed wireless internet. As our guest, you will enjoy each and every morning a hot, homemade full breakfast, which is served in our well appointed guest dining room. 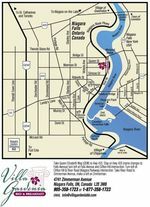 If you are looking for a relaxing, romantic getaway or an exciting weekend outing, Villa Gardenia Bed & Breakfast will help make your Niagara getaway a memorable one. We invite you to experience a holiday with us like no other in our cozy, hospitable and relaxing atmosphere. The two International Bridges, bus and railway stations are located nearby. Themed packages are also available such as, Golf, Winery, Birthday and Anniversary, please inquire. Winner of the Trip Advisor Award of Excellence 4 years running!!! A hot homemade full breakfast is served each and every morning with farm fresh eggs, bacon, toast, pancakes, fresh fruit, cinnamon french toast, cereals, juices, milk, tea, and fresh brewed coffee.